Flash Floods, Landslides In Indonesia Kill Dozens Torrential rain led to flash floods and landslides that swept away homes, buildings and people. Rescuers continue to search for survivors as waters recede in one of the poorest parts of the country. Flash floods have killed at least 58, injured dozens and displaced more than 4,000 people in the Indonesian province of Papua, according to disaster officials. Following heavy rains on Saturday, flash floods hit the town of Sentani, killing 51 and injuring 74, according to Reuters. Nearby, in the provincial capital of Jayapura, seven more were killed when landslides caused by the same rains slammed into homes and swept away residents. In a message to reporters, Indonesia's National Disaster Mitigation Agency spokesman, Sutopo Purwo Nugroho, said, "The number of casualties and impact of the disaster will likely increase as search and rescue teams are still trying to reach other affected areas." Nine houses were washed away in Sentani, Nugroho said. As the water begins to recede, officials are still trying to evacuate people. 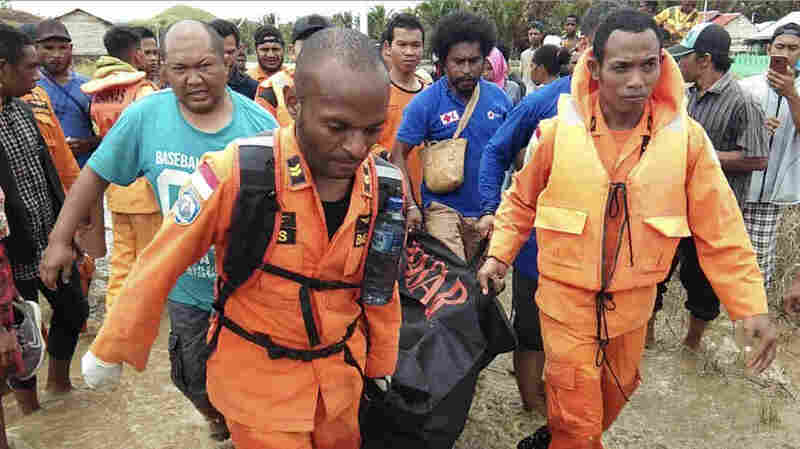 "The joint search and rescue teams are still doing evacuations, and not all affected areas have been reached, because of fallen trees, rocks, mud and other material," Nugroho said, according to Agence France-Presse. Nugroho posted videos online that showed waters rushing through streets and town centers. After daybreak, online videos showed rescuers and residents clambering through debris. In one video, an airplane with a damaged nose and propellers lay in the mud. "Our house was flooded with thick mud. ... We immediately grabbed our valuables and ran to a neighbor's house to seek refuge. ... It's hard to get out of the area because many roads are blocked. ... I'm worried, sad and scared all at one time," Lilis Puji Hastuti, a 29-year-old mother of two young children in Sentani, told Agence France-Presse. "Few people outside the region understand just how regularly natural disasters occur throughout Indonesia's 5,000-kilometer-wide archipelago. More than 2,000 serious disasters are reported each year, 90 percent of which are weather-related — mostly the result of flooding rains, tornadoes, fires and mudslides. In 2017, Indonesians reported 787 floods, 716 tornadoes, 614 landslides, and 96 forest and ground fires (burning peat lands and rainforests to make room for large palm oil plantations and smaller farms is a popular practice, especially in Sumatra)." Papua, Indonesia's easternmost province, occupies the western half of the island of New Guinea. The region is rich in natural resources, but the poverty rates there are some of the highest in the country. As Time reported, despite its reputation as Indonesia's "land of gold," Papua is the country's "poorest province, where 28% of people live below the poverty line and with some of the worst infant mortality and literacy rates in Asia."